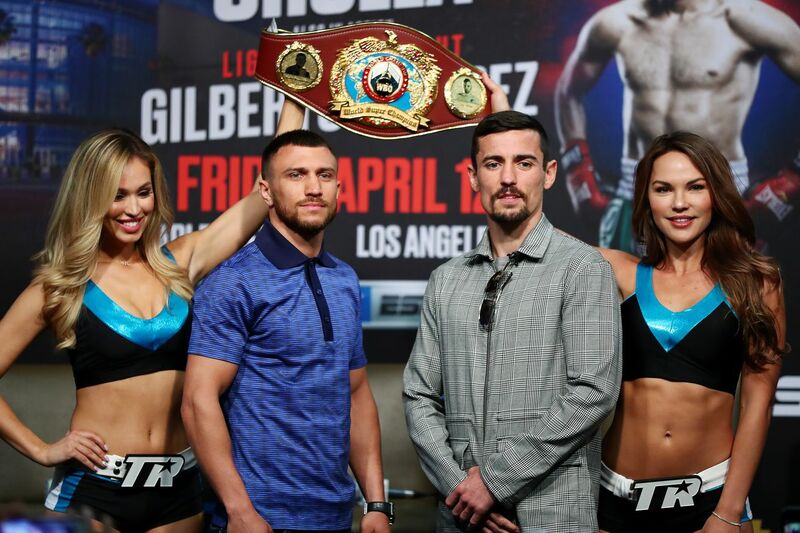 Boxing’s pound-for-pound king returns to your airwaves TONIGHT (Fri., April 12, 2019) when Vasyl Lomachenko defends his two titles against former champion Anthony Crolla inside Staples Center in Los Angeles, California. MMAmania.com will deliver LIVE coverage of the main card below, starting with the ESPN+ broadcast (get a free trial here) at 11 p.m. ET. The original plan was for Lomachenko (12-1, 9 KO) to put his WBO and WBA “super” belts on the line against newly-crowned IBF champion Richard Commey in a unification match, but Commey wound up injuring his knuckle in the process of winning the belt. As a result, Lomachenko now faces his WBA mandatory in Crolla (34-6-3, 13 KO), a former champion in his own right who’s won three straight since a pair of losses to Jorge Linares. In the co-feature, WBO Super Middleweight champion Gilberto “Zurdo” Ramirez (39-0, 25 KO) tests the waters at Light Heavyweight against veteran Tommy Karpency (29-6-1, 18 KO). Round one: Lomachenko southpaw, Crolla orthodox. Slow start, not too unexpected. 1-2 to the body from Lomachenko a minute in. Tries a 2-1. Crolla with a two-piece downstairs. One minute to go. 1-2 in the corner, lovely combo by Lomachenko. 1-2-3 from Lomachenko. 10-9 Lomachenko. Round two: Lomachenko on the advance. Crolla lands a jab. Combo attempt. Counter right from Lomachenko, one minute in. Left hook by Crolla, 2-1. Lomachenko with an uppercut and straight left. He backs Crolla to the corner, can’t capitalize. Crolla with a right downstairs. One minute to go. Crolla fires a left downstairs, blocks an uppercut. Lomachenko with a brutal four-piece in the corner. Nasty body shot kicks off another combo. He ends the round with a left straight to the body. 10-9, 20-18 Lomachenko. Round three: Bouncing punches off each other’s guards. Lomachenko with a hard three-piece. Backs him to the ropes. One minute in. Another low-high combination. Lomachenko pivots into a double left hand. Lead left in the corner. Lomachenko opening up on the ropes. Crolla left hook in the center. Double jab by Lomachenko. Crolla lands an uppercut that draws a nod. One minute to go. Lomachenko firing his jab, comes up top with a cross. Combo in the corner and Crolla’s reeling. Combinations piling up and the referee calls a down. 10-8, 30-26 Lomachenko. Round four: Lomachenko backs him to the ropes and goes back to firing artillery. He wants the finish. Nasty body shot, more combinations. Crolla throwing back bravely, but a right hook sends him face-first to the mat. Damn. Round one: Ramirez pawing with the jab. Karpency lands a counter. Uppercut to body shot by Ramirez. Right hand upstairs, avoids the return fire. Uppercut blocked. Karpency moving forward. One minute in. Ramirez to the body, Karpency answers in kind. Ramirez lands a left downstairs, takes a cross around the guard. They trade body blows. Up-jab from Ramirez. Right uppercut. 1-2 by Karpency lands clean. One minute to go. Ramirez lands a three-piece, left cross soon after. Karpency goes low-high, backs Ramirez to the ropes. Clinch. Ramirez with a short uppercut before the bell. 10-9 Ramirez. Round two: Ramirez with a right downstairs. Karpency ties up. Another body shot by Ramirez, eats a right hook and comes back with a combo. Good combination around the guard, looking more aggressive. Uppercut catches Karpency leaning. Karpency with a good combo on the ropes. One minute in. Ramirez bangs the body to kick off a combo. Stiff jab, clean uppercut. Body shots, left cross. Karpency’s counters whiff. Another left hand around Karpency’s guard. They slug in the center and Karpency connects well. One minute to go. Ramirez with a body shot to uppercut. 1-2 upstairs. Karpency lands a heavy straight left, eats one in return and they trade big punches. 10-9, 20-18 Ramirez. Round three: Ramirez continues to target the body. Left cross and jab. Sneaky right uppercut. Karpency counter right. One minute in. Ramirez looking to put together combos. 1-2-1-2. Left hand from Karpency, body shots from Ramirez. Good left to the body inside. One minute to go. Ramirez with a right hook downstairs. Karpency lands a left downstairs and gets cracked by a hook off the jab. Good combinations from Ramirez. 10-9, 30-27 Ramirez. Round four: Ramirez continues to pile up the shots. Karpency’s return fire is few and far between. Ramirez to the body. Karpency jabs. One minute in. Ramirez’s right hand lands twice in succession. Right hook on the pivot. Jabs and a left cross. They trade in the center. Low-high combo. Karpency lands a hard 1-2. One minute to go. More combinations in the near corner. Ramirez isn’t doing massive damage, but it’s target practice. 10-9, 40-36 Ramirez.